Inner city Stockholm is made up of several distinct neighbourhoods each with their own character and attraction. Here are the main ones, with my tips for what’s worth seeing in each neighbourhood. Do you have any other tips? Please let me know! The island of Kungsholmen is an expanding residential area with turn-of-the-century architecture in the eastern part, functional 40’s-60’s buildings in the centre and modern new builds in the western section. An increasingly popular area, Kungsholmen has lots of restaurants, shops and cafés to enjoy. The island has a waterfront trailing leading all around the island for about 10 km and passing through varying landscapes. Vasastaden to the north of Stockholm is a classic part of the city. An area inhabited mostly by wealthy residents, it has wide roads, grand buildings, restaurants, cafés, shops, churches and offices. With close proximity to the city, Vasastan has several parks, the biggest being Vasaparken which is a playground for residents enjoying football in the summer and ice skating in the winter. – Clas på Hörnet – traditional restaurant/hotel housed in a centuries old roadside inn. Östermalm is the upscale, upmarket neighbourhood in Stockholm. Symbolic of this area are exclusive buildings, designer shops, high-end restaurants, expensive cars, elegant cafés and speciality boutiques selling the latest in classic food and design. This is the most expensive part of town to live in and the surroundings and residents reflect it. Several beautiful parks provide the wide avenues and boulevards with a verdant edging. The hustle and bustle of Stureplan gives way to the quieter residential roads to the north. Stureplan is also a centre for some famous nightclubs which let only the most desirable clientele. 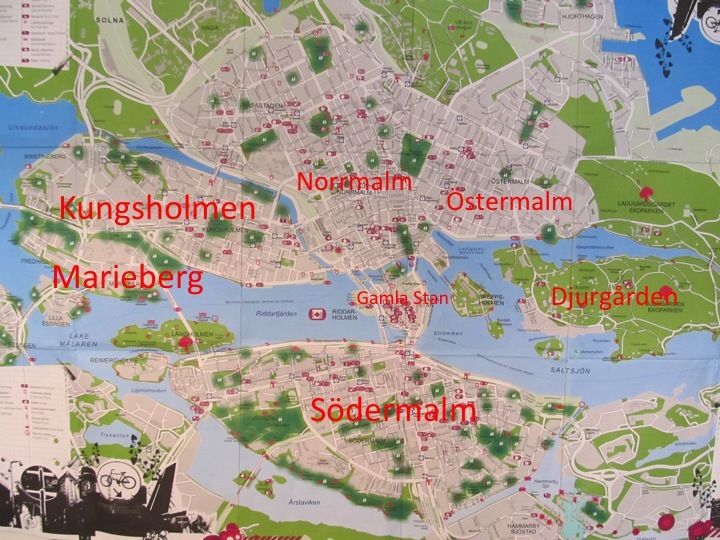 The island of Södermalm is the southern part of the main city. Initially a very poor area, and then the place for Stockholm’s working-class to live, it has in recent years been gentrified and trendified into an urban melting pot of designers, artists, musicians, the gay community, and hipsters. Södermalm, or Söder, was recently declared by Vogue to be the third coolest neighbourhood in the world. And experiencing its artisan bakeries, bohemian cafés, on-trend shops, and experimental restaurants, it’s easy to see why. From Stockholm’s harbour you see the heights of Söder dominated by its churches and impressive hill-top buildings. The city centre area and the main place to find mainstream shops and chain restaurants. This neighbourhood has more and more residents as inner city rejuvenation speeds up but it is mostly the place of business and commerce. Here’s where you’ll find Stockholm’s three main department stores: NK, Åhléns City and PUB. The center of urban outdoor activity is here too – Kungsträdgården – a park dedicated to the pleasure of Stockholmers year round. In the summer, there are festivals, in the winter ice skating and in the spring the park is enveloped in the beautiful vibrant pink of cherry blossom. Stockholm’s origin, founded on a small island between the lake Mälaren and the Baltic Sea was for centuries an important centre of trade in the Baltic region. The town we see today was set up in the 1300’s and most of the buildings are from the 1700’s and 1800’s. Around 3000 people live in Gamla Stan and the neighbourhood is full of colourful buildings, narrow cobbled streets, alleyways, churches, national buildings and touristy shops and restaurants.